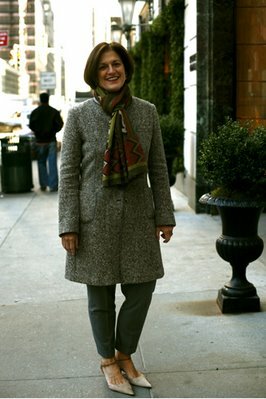 Comments on "On The Street.....Uptown, Manhattan"
Aren't her feet cold now, at this stage of the year? This is a nice modern direction and she is very attractive with a nice shape. She could get away with a more closely-fitted, tailored look, too, what do you think? Nice accessories -- scarf/shoes.Great hair. what's up with this? i know NY weather is tricky, but this is really confusing. winter coat and summer shoes is definately a no no in my book. Sorry, but I think the proportions are off here--and there's a disconnect between the warm, slightly bulky dress above, and the foot-baring shoes below: brrrrr! Finally, a "REAL" woman who doesn't weigh two pounds! Her look is understated and chic. I think she looks great! She's a beautiful woman but! her sense of dressing seems to have gone for a looong walk on that particular day! This is one of those very rare occasions I do not agree with you, Sart! Wait, I don't think she's that bad, but there is something amiss here. There's something that doesn't quite click, just cant put my finger on it. But the pices on their own are quite good aren't they? Still something missing though. she is so natural and feminine... pretty elegant, love it!